There are various molecules (A–F) drawn in different forms and projections. To answer the following questions, you need to refresh your memories on the concept/definition of “Newman projection”, “Fisher projection”, “stereogenic center”, “racemate (racemic mixture)”, and “meso compound”. a. Based on the definition of a stereogenic center, which molecules in the list contain at least one stereogenic center? Choose all that apply. b. 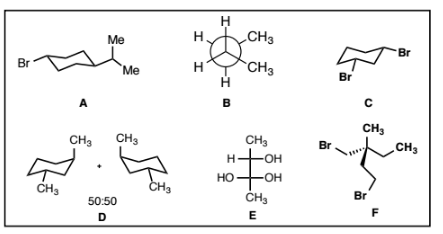 Which molecules in the list are optically active? Choose all that apply. c. Which molecules in the list are chiral? Choose all that apply.